Every year, around halloween, horror movie fans are treated to the release of the next Saw movie. For those who aren't familiar, this is a series of films about diabolical killers and mechanical deathtraps. It's a gory formula that has proven successful in attracting viewers so far. With five films made already, and a sixth coming out this October, it seems that there will be a new Saw movie released every halloween, forever. But economic wisdom tells us that this can't be true. 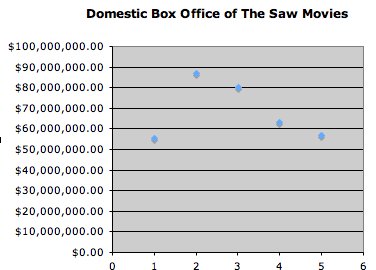 There are bound to be diminishing marginal returns for the Saw movies, right? After the initial jump from the first film to the first sequel, we do see diminishing box office with every film. My theory is that sequels to successful films already have a level of built in publicity, almost like a brand name. So, what will the next Saw movie gross (no pun intended) at the box office? Using an awesome piece of free online statistical software, I have built a multiple regression model to predict the box office results of the next Saw movie. Here it is. 2. A dummy variable (1 or 0) applied if the film is a sequel. This is used to explain the "Sequel Bump" I have seen here. So, I predict that Saw 6 will make $44,876,834 at the box office. We'll find out if my prediction is close at all when the halloween spooky movie season is over.